More than 241,000 pounds of ribs were served at last year’s Best in the West Nugget Cook-Off. That’s a lot of ribs. But if ribs aren’t your thing, don’t worry. More than 241,000 pounds of ribs were served at last year’s Best in the West Nugget Rib Cook-Off. That’s a lot of ribs. But if ribs aren’t your thing, don’t worry. There’s plenty else to feast upon at the annual event, which runs through Sept. 5 at the Nugget Casino Resort in Sparks. Rib vendors and specialty vendors offer tons of food and treats that are non-rib related. Alligator, anyone? There’s also brisket, pulled pork sandwiches and wraps, turkey legs, fried catfish, chicken, corn-on-the-cob and fried green tomatoes, among others. 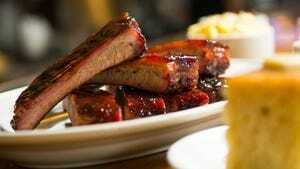 BJ’s Barbecue in Sparks will be serving up beef brisket, chicken, shredded pork, Louisiana hot links, salads, wings and more. Bourbon Q from Westport, Ky., will offer “Bleu Grass,” its signature blue cheese coleslaw. Desperado’s BBQ & Rib Co. from Hinckley, Ohio, will have beef brisket, pulled pork, cornbread, macaroni and cheese and more, including gluten-free barbecue sauce. Hole in the Wall BBQ from Eugene, Ore., is said to be known for a smoked half-pound cheese and bacon burger, prime rib French dip and smoked meatloaf. Johnson’s Bar-B-Que from Chesapeake, Va., will have pit barbecue hams, shoulders, loins and a whole-hog roast. M & M Fish and Chicken Express will sell turkey legs, fried catfish, chicken, alligator and more. There also will be corn on the cob, deep-fried zucchini, onion rings and stuffed potatoes, among other savory items. And, of course, most vendors offer tasty side dishes that could quite easily constitute for a meal: coleslaw, baked beans, macaroni and cheese, cornbread and more. There’s also typical food festival temptations: funnel cakes, kettle corn, chocolate-covered bananas, cheesecake and caramel apples. Drink booths throughout the event sell beer, wine, margaritas, soft drinks, juice, water and lemonade. Too hot outside to eat? New this year is the “Chill Tent.” With a $10 all-day, re-entry privilege admission (children 10 and younger are free), you can bring your grub to the Chill Tent at the corner of Victorian Avenue and Victorian Plaza Circle, grab a seat and enjoy your meal in an air-conditioned space. So, bring on the picky eaters -- even if it’s you -- put on your shorts with the stretchy waistband and get ready to get down with the grub.